These replacement window regulators with motors are just what you need to get your vehicle in good shape again! These window regulators with motors make great replacements and have good cost savings over the dealer units. This repair is easier than you may think. You'll find our installation tips helpful. In our experience removing and replacing the door panel is the most involved step in the repair. On most vehicles this only requires removing a few screws and push in clips. You'll get a great feeling of accomplishment after you complete this repair knowing you saved money and you didn't have to give up your car for a day at the repair shop. Your passengers and other drivers will be amazed. 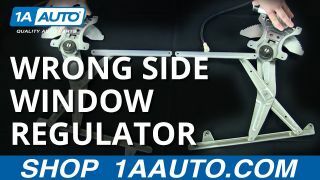 1A Auto will refund you with no hassle, if this Window regulator does not fit the application stated. You can use your existing hardware and wiring harnesses. This Regulator will install just as your original does. Save time and money. Be confident this part will work right. Every regulator is tested after assembly to make sure the cables and all mechanisms are working correctly. It is important that your new regulator works for a long period of time. The design of this regulator is tested to withstand 10,000 cycles. That is enough to raise and lower your window 3 times per day for 9 years. Nothing is more frustrating than taking your car apart and finding the part you purchased does not fit. You want the part to fit. This design is test fit on an actual door. When you install it you will have no issues. Windows that don't work can be frustrating. They can also hurt your vehicles value. An inoperable window could mean $200-$500 discounted off a dealer trade value or asking price. Some shops and dealers charge more for parts and repairs when they think you don't know what is involved. Now you can get the value you deserve. Knowing what this repair entails can be the difference between the value of doing it yourself, or the pain of a costly repair bill. Please Note: These window regulators are high quality aftermarket parts that meets or exceeds the performance of the original. They have been subjected to extensive testing and quality control standards. That is why we offer these regulators with our superior warranty!